The main thrust of a peace officer’s duties consists of an attempt to enforce the law. In our application of the law, we must do it within a legal spirit which was so clearly set forth by the framers of the Bill of Rights, an original part of our Constitution. That bill had as its purpose elevating the rights of each citizen to a position co-equal with the state which might accuse him. Its purpose was to provide for an enforcement of the law with fundamental fairness and equity. Because of the Bill of Rights, the dignity of the individual person in America was placed in an almost sacred position of importance. A peace officer’s enforcement should not be done in grudging adherence to the legal rights of the accused, but in a sincere spirit of seeking that every accused person is given all of his rights as far as it is within the powers of the police. In the discharge of our enforcement of criminal statutes, the peace officer must scrupulously avoid any conduct which would make him a violator of the law. The solution of a crime, or the arrest of a lawbreaker, can never justify the peace officer committing a felony as an expedient for the enforcement of the law. We peace officers should do our utmost to foster a reverence for the law. We can start best by displaying a reverence for the legal rights of our fellow citizens and a reverence for the law itself. The basic mission for which the police exist is to prevent crime and disorder as an alternative to repression by military force and severity of legal punishment. When the police fail to prevent crime, it becomes important to apprehend the person responsible for the crime and gather all evidence that might be used in a subsequent trial. The ability of the police to perform their duties is dependent upon public approval of police existence, actions, behavior, and the ability of the police to secure and maintain public respect. The police must secure the willing cooperation of the public in voluntary observance of the law in order to be able to secure and maintain the respect and approval of the public. The degree of public cooperation that can be secured diminishes, proportionately, the necessity for the use of physical force and compulsion in achieving police objectives. The police seek and preserve public favor, not by catering to public opinion, but by constantly demonstrating absolutely impartial service to the law without regard to the justice or injustice of the substance of individual laws; by readily offering individual service and friendship to all members of society without regard to their race or social standing; by the ready exercise of courtesy and friendly good humor; and by readily offering individual sacrifice in protecting and preserving life. The police should use physical force to the extent necessary to secure observance of the law or to restore order when the exercise of persuasion, advice, and warning is found to be insufficient to achieve police objectives; and police should use only the reasonable amount of physical force which is necessary on any particular occasion for achieving a police objective. The police at all times should maintain a relationship with the public that gives reality to the historic tradition that the police are the public and that the public are the police; the police are the only members of the public who are paid to give full-time attention to duties which are incumbent on every citizen in the interest of community welfare. The police should always direct their actions strictly toward their functions and never appear to usurp the powers of the judiciary by avenging individuals or the state, or authoritatively judging guilt or punishing the guilty. The test of police effectiveness is the absence of crime and the presence of public order. It is not the evidence of police action in dealing with crime and disorder. The task of crime prevention cannot be accomplished by the police alone. This task necessarily requires the willing cooperation of both the police and the public working together toward a common goal. Since the police cannot be expected to be on every residential or business block, every hour of the day, a process must be developed whereby each person becomes concerned with the welfare and safety of his neighborhood. When people are working with other people in their neighborhood, they can effectively reduce crime. Only line police officers perform the tasks for which police were created. They are the operating professionals. Supervisors and managers exist to define problems, to establish objectives, and to assist line police officers in the accomplishment of the police mission. The evaluation of a manager should be based on the improvement and excellence of his subordinates in the achievement of organizational goals. The life’s blood of good management is a thoroughly systematic, two-way circulation of information, feelings, and perceptions throughout the organization. For many reasons, some specialization of work is necessary. Specialization should be created only when vitally necessary. When specialization is created, organization should be adjusted to ensure that the specialists and generalists who serve the same citizens work closely together on the common problems in as informal an organizational structure as possible. This will tend to ensure a unity of effort, resources, and the effective service to a common goal. It must be recognized that the police and the people alone cannot successfully resolve the problems of crime. The criminal justice system as a whole, in order to properly serve the public, must operate as a total system with all of its various elements working together. The close cooperation of the police with prosecutors, courts, and correctional officers is necessary in order to ensure the development of a safer community. One of the first and most fundamental considerations of this nation’s founders in drafting the Bill of Rights was to provide for a free press as an essential element of the First Amendment to the Constitution. They recognized that a well-informed citizenry is vital to the effective functioning of a democracy. Police operations profoundly affect the public and therefore arouse substantial public interest. Likewise, public interest and public cooperation bear significantly on the successful accomplishment of any police mission. The police should make every reasonable effort to serve the needs of the media in informing the public about crime and other police problems. This should be done with an attitude of openness and frankness whenever possible. The media should have access to personnel, at the lowest level in a Department, who are fully informed about the subject of a press inquiry. The media should be told all that can be told that will not impinge on a person’s right to a fair trail, seriously impede a criminal investigation, imperil a human life, or seriously endanger the security of the people. In such cases, the minimum information should be given which will not impinge on the four areas and we should merely state that nothing more can be said. In all other matters in our relationship with the media in dealing with current news, every member of the Department should make every reasonable effort consistent with accomplishing the police task in providing the media representatives with full and accurate material. In order to effectively deal with the most important problems, objectives must be established. The establishment of objectives and the means used to ensure that they are reached must include the participation of those involved in the task. The setting of an objective has very little meaning without the participation of those involved. Since employees are greatly influenced by decisions that are made and objectives that are established, it is important for them to be able to provide input into the methods utilized to reach these decisions. Employees should be encouraged to make recommendations which might lead to an improvement in the delivery of police services and assist in the furtherance of the Department meeting its objective. Police work is one of the most personal of all personal services. It deals with human beings in life and death situations. The police officers and the people they serve must be as close as possible, and where possible must know one another. Such closeness can generate the police-citizen cooperation necessary for the involvement of the whole community in community protection. Organization of assignments should ensure that the police and the same citizens have an opportunity to continuously work for the protection of a specific community. Strength through interacting together and working together on common problems can be enhanced through officers and the people feeling at home with one another in an atmosphere of mutual cooperation. This may be described as a utilization of the "Territorial Imperative." For police-public cooperation, there must be respect of the police by the public. This is best ensured by optimum openness of the Department in its operations. A general feeling and reality of openness must pervade the police organization. Above all, the police officer must be consistently open, honest, and trustful in all matters. A combination of honesty and openness will effectively develop respect in the community for the police and make it possible for citizens to come to them with problems and information. Where this trust does not exist because of a lack of honesty or openness, the channels of communication between the police and the public are clogged and the police must desperately struggle on alone. The Los Santos Police Department is a local wide law enforcement agency that makes sure that the entire unity of Los Santos is protected and served under the United States Constitution. 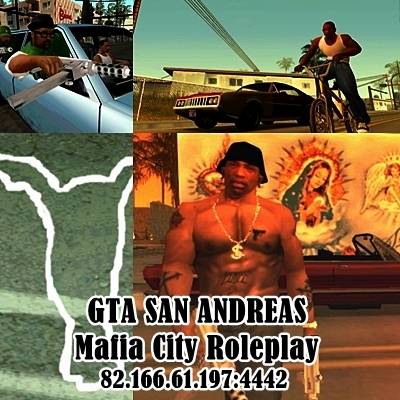 However, there is a state police department nearby known as the San Andreas State Police Department. With them being where they are, the Los Santos Police Department has a tendency to stay away from the borders of Los Santos. With that being said, the Los Santos Police Departments' jurisdiction lines range from any area within the local area of San Andreas staying in the Los Santos area only. All other boundaries such as Red County, San Fierro and Las Venturas are off limits to the department except for the FBI, SASP and SASD. Officers may enter their jurisdiction with permission and if they are responding to emergency calls. -> This vehicle is the standard cruiser for the Los Santos Police Department and can be used by any member of the police department except Cadets who need to be with an Officer or above at all times. -> This vehicle is a cruiser mainly used by the Sergeant's of the department. Any lower ranks must ask permission and must get it granted before stepping foot inside. -> This vehicle is a cruiser mainly used by the Chief of the department. Any lower ranks must ask permission and must get it granted before stepping foot inside. -> This vehicle is the Rancher for the Los Santos Police Department and can be used by any member of the LSPD that is of the rank Captain or above. Officers, Corporals and Sergeants may ask permission from a Captain or above to use this vehicle for patrol. -> This aircraft is the police maverick for the Los Santos Police Department can be used by any member of the LSPD that is the rank of Sergeant or above. Officers and Corporals may ask permission from a Sergeant or above to use this aircraft for a vehicle pursuit. -> This vehicle is used by the SWAT members of the department for riot situations. Only SWAT members may drive this vehicle unless granted position by the SWAT Captain to drive it. -> This vehicle is used by the SWAT members of the department for SWAT situations. Only SWAT members may drive this vehicle unless granted position by the SWAT Captain to drive it. -> This is the only vehicle in the LSPD arsenal that can survive in the water. It is fast compared to most boats available in the market. This is the only way to deal with boat pursuits. This is to be used by SWAT only during situations unless granted by a Captain to be used otherwise. -> This vehicle is not very good for detainment as it can be easily crashed upon making suspects able to fly off of it. It's relatively easy to use and must be granted permission by a Sergeant or above for usage.